The Oster Pro is a powerful blender allowing you to use it in a number of different ways, including making smoothies and salsas. There is a food chopper as well as a blender, giving you a decent range of versatility. Regardless of what you're making, there's a decent chance this machine can provide some help; it's certainly worth trying out at any rate. Related Reading: Check out our reviews on the best blenders for green smoothies. Plenty of controls for a variety of foods. Lots of controls may get slightly confusing, but overall are quite clear. Not as many accessories as other options. This is a blender that can handle pretty much whatever you throw into it. It offers a blender container as well as a bowl for when you need to chop or mix. You'll also get 1200 watts of power to ensure that the blades can chop through just about anything you need it to. Furthermore, it also includes three convenient programs for smoothies, salsas and milkshakes at the touch of a single button. If you don't want the pre-programmed options, there are also 7 speed settings that you can choose from in order to get just the results you need. Unlike other options out there, this one contains blades that can turn in both directions rather than just one. Find &amp; Register Your Domain Today! This is great for improving how easily your ingredients flow down to the bottom and receive an even blending. With other options, chunks of food can sometimes get stuck, but that won't happen with this device. Many users find this to be a durable, reliable device that they can use on a daily basis. It's perfect for making healthy smoothies and allows for plenty of space if you want to make enough to share. Furthermore, it comes at a price that many find to be quite affordable. This product is for those who value versatility in their kitchen products. It allows you to get the job done reliably without having to use multiple appliances for one job. As a result, it cuts down on money spent on those appliances, dishes you have to do, and space that has to be given up. Because it offers a lot of value at a decent price, it's also a great choice for those who are on a budget. Instead of multiple expensive appliances, you can get just one product at a fair price and it will be able to handle the majority of your needs. The attachments allow for a lot of control, and the ease of use makes it ideal for just about anyone. It's also excellent for those who are working to create healthier habits. With one easy machine to process your fruit, vegetable and nut recipes, it's a whole lot easier to eat healthfully. 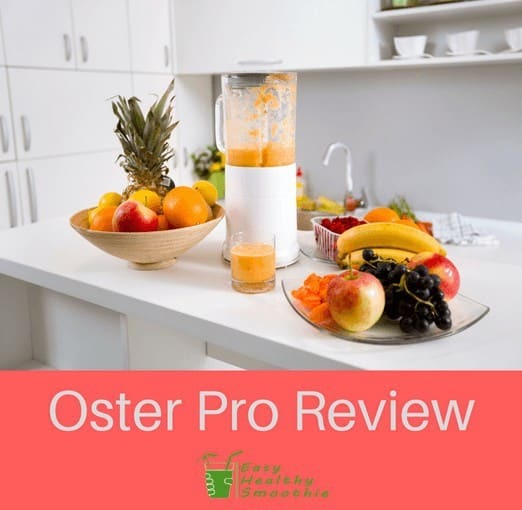 When you order the Oster Pro, you'll get a 6-cup glass jar, a 24-ounce to-go cup for smoothies, a BPA-free processing bowl, a chopping blade and a slicing disk made from stainless steel. On top of that, Oster provides a 10-year warranty that will make sure your investment is safe as long as it's used in normal ways; that's a warranty that can put a wide variety of other appliances to shame, and it can leave you feeling safe and confident that you're covered should there be any problems. They also have a great service and support facility. Thanks to all the accessories that come with this device, there's a lot you'll be able to do using it. The blade also works to make sure you're able to get the very most from the device by making it easier for food to be chopped or blended. For those who want a little extra control, the pulse setting allows you to get the food handled at your own speed. This is great if you're trying to achieve a certain texture or are using a new recipe you haven't had the chance to feel out just yet. Overall, this is a blender that is made to be smooth and work quickly so that your tasks can get done in a flash. The buttons are easy to use, allowing you access to any setting you may need. Whether you want to use a pre-programmed method or set the speed, you'll be good to go. The Oster Pro is a device with a lot of power and versatility. As a result, it's an option that can save money as well as space for many users. Many users find that they get a lot of value while using it. For those who are seeking one device that is capable of multiple tasks, the Oster Pro is an ideal choice. It comes with a lot of great features and a warranty that is even better. You can't go wrong with trying out this set.